I am one of the lucky individuals who grew up skiing. Although growing up skiing in Illinois meant calling sheets of ice you couldn’t poke a pin through…it was still skiing. Now that I live in Colorado, skiing has involved glorious things like 3 feet of powder in a week, 3.5 mile ski runs and more terrain than I can possibly visit in a day. Shortly put, I LOVE it. While the majority of the important people in my life either ski or snowboard, alas, there are always friends who get left behind and forgotten about because they haven’t had an opportunity to experience my favorite sport. This year, Keystone is hosting a series of events designed to help introduce people to skiing and snowboarding called The Mountain Experience Series. It is a way to turn, “You need to learn how to ski or snowboard!” into reality for your friends and family. 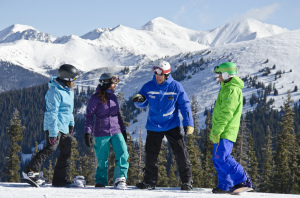 Perfectly timed at the start of the ski season, Get to Know Keystone Days will give those new to the sport an entry level package to learning to ski or snowboard and those looking to brush up on their skills an easy excuse to get back out there. 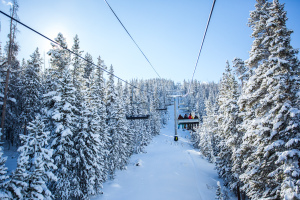 This package includes $59 lift tickets, Free 1 hour ski and ride clinics and a 30% discount on rentals through Keystone Sports so that friends can demo gear on the cheap. Keystone is also offering lodging discounts that allows you to stay the night and experience more of what Keystone has to offer. Rooms starting at $132 per night at the Inn at Keystone. Keystone’s Ski and Ride School will provide complimentary one hour clinics Saturday and Sunday at 11 a.m. and 2 p.m. for first-timers or guests looking to hone their skiing or riding skills. Participants in the free, hour-long sessions must be at least 11-years-old. Simultaneously, hour-long sessions at the Keystone Snow Fort will provide a place where children of any age can play in the snow, meet Keystone mascot Ripperoo, and meet Keystone’s avy dogs – supervision will be provided free of charge. Guests can meet for these activities atop Dercum Mountain. Speaking of more to offer, Get to Know Keystone Days will be just one of the many events happening at Keystone that weekend. The Resort will also be celebrating the season opening of Kidtopia and the Kidtopia Snow fort. This celebration involves ice cream, cookies, Santa, children activities, a parade and fireworks. Did I mention cookies? Couple those two events with Keystone’s every day winter activities like snow tubing, mountain top cat tours and dinner sleigh rides and your weekend is booked solid. Just maybe you can fit a relaxing trip to the spa to recover from learning your new favorite sport! Sponsored by Burton, this event is for those who want to start, improve or come back to the sport of snowboarding. Similar to Get to Know Keystone Days this weekend will offer discounted lift tickets, Free 1 hour ride clinics and a Burton Snowboards demo day so your friend can try a variety boots, boards and bindings for free. Keystone is also offering great lodging deals starting at $168 per night so that you can experience more of what Keystone has to offer. If you are introducing the sport to a friend, send them off to a free one hour clinic while you take advantage of the Keystone Ambassadors who will be on site to give tours of the mountain and reveal some of their favorite runs and navigational tricks as well as the best trails for a family, how to progress in A-51 or find out where the best tree and glade riding is on Keystone. The Free, hour-long snowboarding clinics will be available for anyone age 3-and-older at 11 a.m. and 2 p.m. in the Mountain House base area on Saturday and Sunday. Can a 3 year old really snowboard you ask? Why Yes. Keystone has partnered with Burton Snowboards to create “Ripperoo’s-Burton Riglet Park” located in the Mountain House Base Area. An on-snow snowboard park and play area with fun terrain designed to introduce young children (3-6 year olds) to snowboarding. A “Riglet Reel” is fastened to the front that allows young children to explore the park and feel the balance they need to ride. Playing in the park on small rolling hills and a mini-half-pipe allows children to gain the muscle memory to begin sliding and making turns on sloped terrain. Once you’ve enjoyed your day on the mountain meet back at River Run to enjoy a free concert. While, the exact band hasn’t been announced …rumor has it the concert will be THE way to end your day at Keystone. Can’t Make These Great Events? Available daily throughout the season, group lessons are a fun way to learn the basics and enjoy learning the sport. Keystone offers a First Experience class for those brand new to either skiing or snowboarding as well as 3 levels of beginner classes. If you already know how to ski or snowboard but want to improve, sign up for an intermediate or expert lesson. Available daily throughout the season. Interested in sharing your love of skiing or snowboarding with your kids? Sign them up for a group lesson for $168. 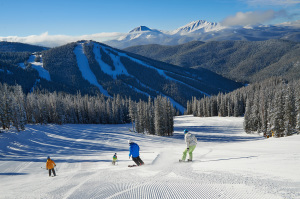 Keystone also offers daily Children Ski School Lessons throughout the season for ages 3 – 14. Children lessons are grouped out by age as well as ability level ensuring your child the perfect environment to learn and enjoy winter sports.